This is an uncommonly interesting programme and the four pieces that comprise it make a satisfying combination. I have to say that I’m not sure about the “for a time of War” tag, which is unexplained in the booklet notes. The Ives piece was written in peacetime; the Adams work, although it is a setting of words rooted in the American Civil War, was more inspired by the composer’s experiences of the last illness and death of his father as well as the fact that several people close to Adams had died of AIDS. The Britten was certainly a product of the war years but the Vaughan Williams symphony, though finished as the political storm clouds began to rise in Europe in the 1930s, is now generally accepted to relate to his personal situation at the time: a recent film, The Passions of Vaughan Williams, suggested that the work has a lot to do with his frustrations at the increasing ill health of his first wife, Adeline. Let us not quibble, however; there is much that binds the works together and the key thing is that the programme is musically satisfying. It’s also extremely well executed: there’s some very fine music making to be experienced here. The Unanswered Question is given a refined and cultivated reading. However, despite the sensitivity of the performance a couple of doubts crept into my mind while listening. I wondered if it’s not a bit too slow - but then reminded myself that the recordings by both Leonard Bernstein and Michael Tilson Thomas are even more expansive. However, John Adams on his 1989 album American Elegies (Elektra Nonesuch 79249-2) gets through the piece in a ‘mere’ 4:49 and I rather like his refusal to linger excessively. Slightly more concerning is the fact that I’m unsure that the woodwind interjections sound sufficiently “quarrelsome”, as annotator Steven Kruger aptly describes them. However, the piece is very well played indeed. John Adams’ The Wound-Dresser is one of his most thought-provoking pieces. It’s a setting for baritone and small orchestra of lines from Walt Whitman’s Drum Taps in which the poet describes graphically his experiences ministering to wounded soldiers during the American Civil War. The text is grim and stark, evoking some harrowing imagery and it seems to me that one of Adams’ great achievements in the piece is the avoidance of any mawkishness or hysteria. The piece, which is a declamatory soliloquy for the baritone, is surprisingly calm and restrained in tone. Though it depicts a war-time scenario Adams was inspired to write it having experienced his father’s terminal illness and also after the AIDS-related death of a number of friends. The performance benefits from two things. One is the sensitive and committed conducting of Carlos Kalmar, who, as in the Ives, obtains very fine and responsive playing from his orchestra, not least from Jun Iwasaki, who was the concertmaster at the time. The second is the presence of baritone Sanford Sylvan. Mr Sylvan has a very close association with John Adams’ music; he created the role of Chou En-Lai in Nixon in China and the title role in The Death of Klinghoffer and went on to give definitive performances in the recordings of both operas. Even more relevantly, it was he who gave the first performance of The Wound-Dresser in 1989 and he went on to make the first recording, with the composer conducting, later that year (Elektra Nonesuch 79218-2). Comparing the two recordings I find there’s little to choose between them: both are first class. Sylvan is a most eloquent soloist on this new recording - as he was in 1989 - and he’s accorded a lovely natural balance against the orchestra. If you haven’t heard this fine piece before then the present disc would be an excellent way to experience it. Sinfonia da Requiem is very well done indeed. Kalmar directs a very powerful account of the first movement, ‘Lacrymosa’ but, despite the arresting opening and several other potent passages there are many stretches of this movement that are much more subdued and these are played with great refinement. The second movement, ‘Dies Irae’ spits and snarls as it should. In a reading of great energy and drive one cannot but admire the precision of the Oregon Symphony. The finale, ‘Requiem Aeternam’, is much more consolatory in tone; the violence is past. The orchestra responds to this change of mood with some very beautiful, dedicated playing. Here, I must make comment about Steven Kruger’s notes, which I’m afraid I find disappointingly tendentious in relation to this work. Leaving aside the factual error that Britten “set [the piece] before the public” in 1940 - the first performance was given in New York in March 1941 - I really have some difficulties with his assertion that “it is not a stretch to view it as depicting the Battle of Britain then taking place.” I can agree with him that Britten came to feel increasingly uncomfortable in the safety of the USA while Britain was at war. However, I’ve never read anywhere else the suggestion that the Sinfonia, which was composed in a great hurry to meet a rapidly approaching deadline, depicts the Battle of Britain. According to Humphrey Carpenter’s biography of Britten the work was completed in June 1940. However, the battle of Britain really only began the following month. Possibly the events of the Spanish Civil War, which had affected the pacifist Britten quite considerably provided more of an impetus for the work but this is not a piece about the Battle of Britain. I don’t think Mr Kruger helps his cause either by statements such as this one about the third movement: “Britten now undertakes to do what any good English composer does for serenity - he walks the listener home.” I bet Britten would turn in his grave at rubbish like that! Forget the notes and concentrate on the performance, which is a fine one. Impressive too is the reading of Vaughan Williams’ Fourth Symphony. The account of the first movement is robust and potent; the orchestra’s playing is very dynamic. The slow movement is also well done. Much of this is brooding music and Kalmar’s interpretation is probing. He controls the stretches of quiet music very well while the climaxes have strength. The tempestuous third movement is delivered with great thrust and vigour; the spiky irregular rhythms are articulated very well. As for the finale, it erupts. The performance is as fast as I can recall hearing it - though it’s not rushed; Kalmar exerts a fine grip on proceedings. The music boils and the brass playing is superbly incisive; mind you, the whole orchestra is incisive. There’s no applause after the performance - nor is there after any of the pieces - but I bet that on the night the audience were enthused by this performance, and rightly so. I listened to this hybrid SACD as a conventional CD and I found the sound was very good indeed. 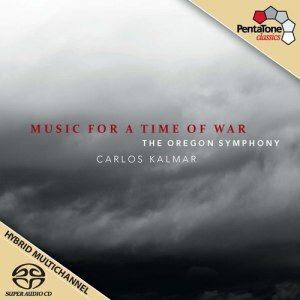 The recording has clarity, presence and depth and it shows the excellent playing of the Oregon Symphony in the best possible light, which is what the quality of their playing deserves. Immediately after these concerts the orchestra took the programme to Carnegie Hall for the inaugural Spring for Music season there. Unfortunately their appearance there was not reviewed by MusicWeb International Seen and Heard but my colleague Bruce Hodges caught the concert that the Toledo Symphony and their conductor, Stefan Sanderling gave in the same series and in his review he said this: “In Toledo next season the ensemble will replicate another Spring for Music concert, conductor Carlos Kalmar’s program with the Oregon Symphony…... The reason: Sanderling and the orchestra wanted to retain a festival souvenir - how can one not smile at such an imaginative coda?” I’m reminded of the proverb that imitation is the most sincere form of flattery. I’m not surprised that Sanderling should wish to replicate such an interesting programme as this one. I presume that the Oregon Symphony gave as good an account of themselves in Carnegie Hall as they do on this disc for I understand that they’ve been invited to return to New York for the 2013 Spring for Music series. That’s in the future. The orchestra’s next CD for Pentatone is already in the can, I understand and will include the Vaughan Williams Fifth Symphony and Elgar’s ‘Cockaigne’ Overture, recorded in concert in February 2012. That’s something to look forward to, especially if it turns out to be as fine as this present CD.